Would you like to discover audio listening exercises that help you understand real English? All of my students want to improve their listening comprehension and you probably want to be able to do the same from the comfort of your own home. Let me share some of my best advice with you. One of the biggest complaints I hear about audio materials is that the speech is really slow. Who actually talks that slow in real life? English Express is designed to help prepare you for the real world of English. Life is not in the classroom, it is outside with people who speak English in a natural way. That is why English Express presents natural English. You might find it difficult at first, but challenging yourself at home will prepare you for speaking with others in your office, on the phone and while travelling abroad. Bettina is a motivated English learner just like you. 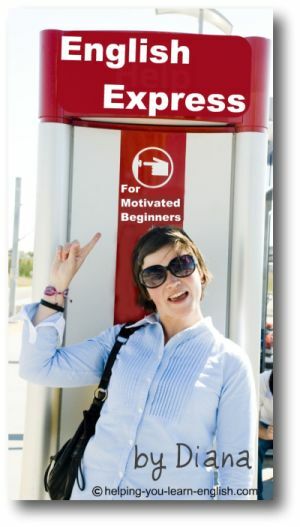 Listening Exercises for Motivated Beginners" Today! Why are these Listening Exercises Special? 1) The MP3's are not slow or robotic. It gives you the opportunity to listen to English that you could hear in the real world. 2) I contract words (don't, I've, It's) and I also speak at an almost native speed (I slow it down a little, but not a lot). 3) I add my own enthusiasm and personality to help keep you motivated. This course is like talking to a friend about life...just grab a cup of coffee and press play. English Express Makes it Easy to Succeed! It is a direct and focused course – containing 20 units - that provides you with enough material to increase confidence and improve your listening comprehension, but does not overwhelm you with too much information. You receive 20 high quality MP3s, written transcripts, exercises and an answer key. All of my materials and courses, including English Express, come with my 100% Money Back Guarantee. I'll gladly refund your money; no questions asked. PS: This is one of the fastest ways you can improve your listening skills because you can download it instantly. In less than 5 minutes from now you could be listening to my voice and working your way through the English Express program. 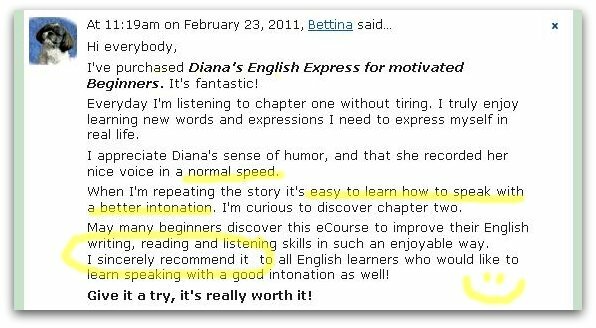 Once you get your English Express listening exercises I highly recommend signing-up for my free monthly newsletter for additional motivation and support.